The Galway Film Fleadh is rapidly approaching and among the gems to look out for is the world premiere of All The Wild Horses, Ivo Marloh’s terrific feature-length documentary about the Mongol Derby. This is the longest and toughest horse race in the world. 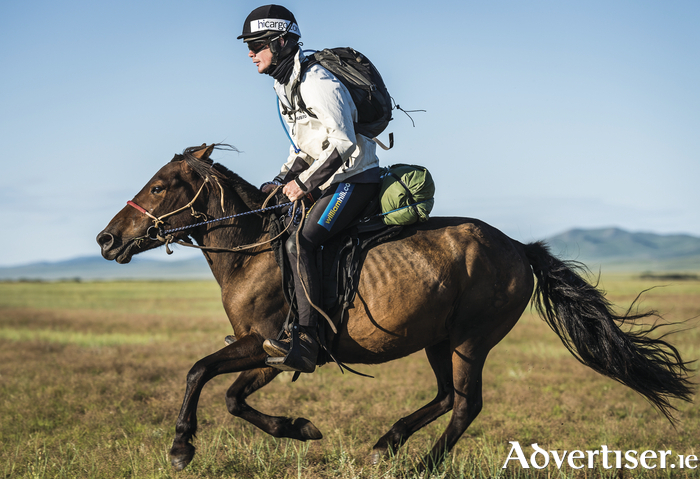 With a route based on Genghis Khan’s empire-wide network of postal depots, the 1,000 kilometre race sees riders from all over the world and all walks of life compete on a relay of semi-wild horses across 25 stations in the Mongolian wilderness. Taking over a week to complete and entailing dawn-to-dusk rides, arduous terrain and extremes of weather, this is an epic equine adventure without equal. Marloh’s film captures all the race drama as it unfolds amid the stunning steppe landscape and Fleadh audiences will surely be drawn to the stories of the two Irish riders taking part; Donie Fahy, from Meath, and Galway’s own Richard Killoran who both came to the race with backgrounds as professional national hunt jockeys. Ahead of All The Wild Horses’ Galway premiere, Richard Killoran chatted with me about his experiences and impressions of this unique race. Mongol horses are small, sturdy and unruly; very different from the sleek and pampered animals Killoran [photgraphed above by Michael J Sanderson] was used to; “It was like chalk and cheese,” he agrees. “I’m used to being on a horse for four or five minutes going flat out, while here I’d be riding for 40 kilometres. The weather in wintertime there gets down to minus 40 degrees and the horses are living out in that; no rugs, no nothing, proper hardship. I remember coming back home and riding a racehorse and he stepped on a stone and got a bruise and needed treatment for a few days. These horses are going over boulders without a care, they are really tough. Both Killoran and Fahy entered the race intent on winning, yet the film shows them sacrificing precious time to help other riders in trouble or letting fellow competitors ride along with them. “Well with the two girls, Julie and Charlotte, who rode along with us we couldn’t beat them off so we said sure you may as well come along with us,” Killoran notes wryly. The $13,000 derby entry fee excludes most Mongols from taking part in the race –though a Mongol did win its first running in 2009. They are largely present as herders, vets, cooks and ancillary staff. The race is not for the faint-hearted and fewer than half the riders complete the course. Injuries incurred in Richard’s race included a suspected broken neck, a broken collarbone and a punctured lung. It was also a daunting challenge to put on film, as director Ivo Marloh, who also rode in the race, recalls. That union will surely make for terrific fireside tales in the future as to how mam and dad first met but before then audiences can enjoy all the thrills and spills of the most daunting derby on the planet when All The Wild Horses screens at the Galway Film Fleadh (July 11 to 16 ). Screening date and time will be announced in a couple of weeks with the official launch of the Fleadh programme.